When it gets warm (or if you’re just not big into cooking), the last thing you want to do is turn on the oven! 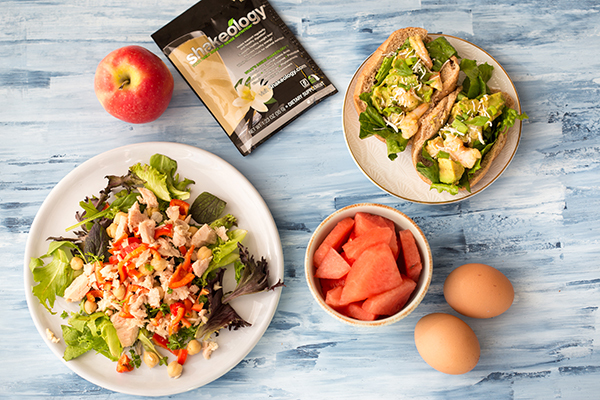 That’s where this no-cook 21 Day Fix meal prep comes in. 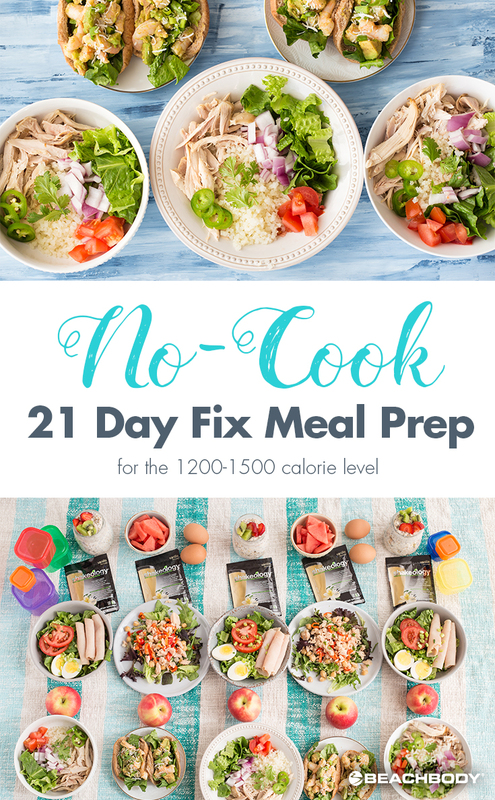 While it’s designed specifically for anyone doing the 21 Day Fix and eating between 1,200 and 1,499 calories, it’s great for anyone looking for a healthy meal prep. If you need more calories, increase the portions or add a snack like one of these. Prep the vegetables and herbs. Rinse romaine lettuce, allow to air dry, and chop 10¼ cups. Rinse spring lettuce mix and allow to air dry. Remove the skin from one red onion and dice into small pieces. Rinse, deseed, and dice 1 cup red bell pepper. Rinse and cut 6 slices of tomato + 3/4 cup chopped tomato. Rinse and dice ⅜ cup (6 Tbsp.) green onion. Rinse and loosely chop ½ cup parsley. Rinse and loosely chop ⅜ cup (6 Tbsp.) cilantro. Rinse, deseed, and slice 3 Tbsp. jalapeño. Store any unused vegetables for future use. Prep the Healthier Ranch Dressing for the Cobb Salad. In a food processor, combine 2 Tbsp. dried parsley, 2 tsp. dried onion flakes, 2 tsp. onion powder, 2 tsp. garlic powder, 1½ tsp. dried dill, 1½ tsp. dried cloves, 1 tsp. salt, and 1 tsp. ground black pepper; pulse until well mixed. Add 1 Tbsp. seasoning to ⅓ cup (2%) plain Greek yogurt and ⅓ cup low-fat buttermilk; mix until well combined. Pour 2 Tbsp. dressing into 3 small containers. Store extra seasoning mix in the pantry and extra dressing in an air-tight container in the refrigerator for future use. Make the Cobb Salad in 3 large storage containers. To each container, add 1¾ cup chopped romaine lettuce, 2 Tbsp. diced green onion, 2 slices of tomato, 3 slices deli turkey, and 1 hard-boiled egg. Make the Tuna Antipasto Salad in 2 large storage containers. Open and drain the chickpeas and 2 cans of tuna. 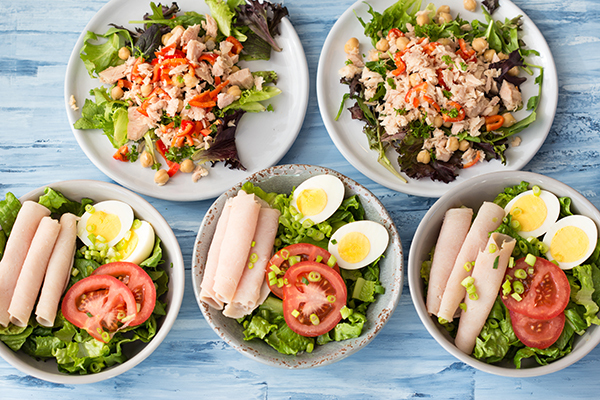 To each container, add 2½ cups spring lettuce mix, ½ cup chickpeas, ¾ cup tuna, ½ cup red bell pepper, and ¼ cup chopped parsley. Store the lettuce on top of the tuna salad to keep from getting soggy. When ready to eat, drizzle salad with juice from ½ lemon and 2 tsp. olive oil. Prep the Avocado Shrimp Rolls. Stir together 2 tsp. mustard, juice from 1 lemon, large pinch paprika, and ground black pepper, to taste; divide dressing between 2 containers and store. Chop the pre-cooked shrimp into large pieces; divide between 2 containers with ¾ cup shrimp going into each container. When ready to eat, dice ¼ ripe avocado and store remaining in an air-tight container for future use. In a small bowl, toss diced avocado with ¾ cup pre-cooked shrimp and 1 container of dressing.Separate a sandwich thin and top each half with 1 cup chopped romaine lettuce, shrimp mixture, and top with 2 Tbsp. shredded unsweetened coconut. 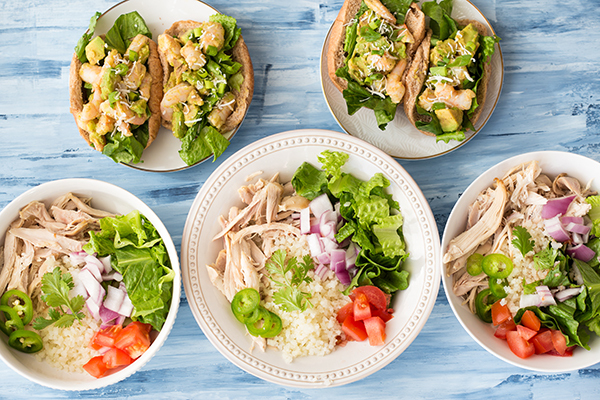 Prep the Chicken Burrito Bowls. Microwave frozen cauliflower rice per package instructions. Meanwhile, debone the rotisserie chicken and shred the meat. Once cauliflower rice is warm and chicken is shredded, assemble the burrito bowls. 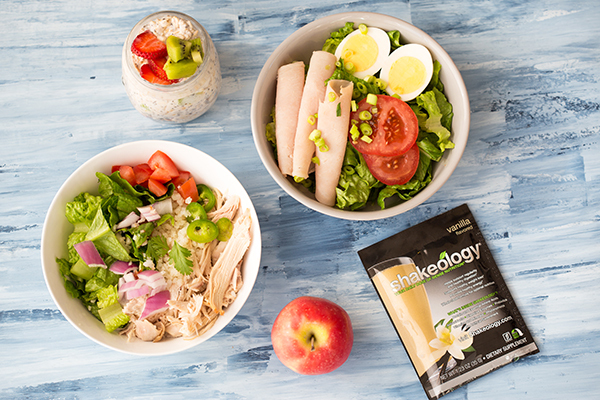 To 3 large storage containers, add ½ cup cauliflower rice, ¾ cup shredded rotisserie chicken, 1 cup chopped romaine lettuce, ¼ cup chopped tomato, ¼ cup chopped red onion, 2 Tbsp. chopped cilantro, and 1 Tbsp. sliced jalapeño. When ready to eat, top each salad with ¼ diced avocado and 1 tsp. olive oil. 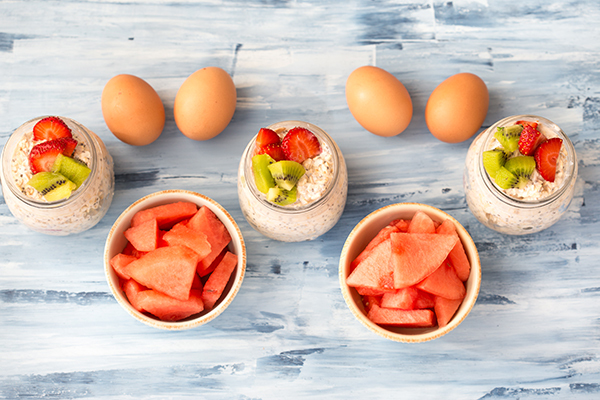 Make the Tropical Overnight Oats. Slice 3 kiwi in half and use a spoon to separate the fruit from the skin; dice kiwi and set aside. Rinse and slice 1½ cups strawberries. In a large bowl, combine 1½ cups old-fashioned oats, 3 Tbsp. chia seeds, 2¼ cups (approx. 18 oz.) Greek yogurt, 1½ tsp. vanilla extract, 3 diced kiwi, 1½ cups strawberries, 3 tsp almond butter. Mix until well combined; divide mixture between 3 storage containers and refrigerate.